Election Commission officials have seized over 79 lakh litres of Indian Made Foreign Liquor during this poll campaign in Punjab. Nearly 3,60,000 bottles of country liquor were confiscated before being distributed to the voters. 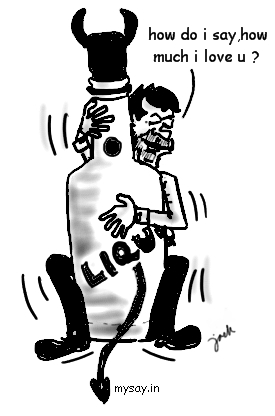 Another 63,000 litres of illegally distilled liquor has been seized. Previously, 183 cartons of alcohol were seized from a truck in Akali Dal candidate Bibi Jagir Kaur’s constituency and hence she is booked for bribing voters. Another Akali Dal candidate, Swaroop Singla, also landed in trouble after organising a party for more than 200 people in a resort in Bhatinda, where booze flowed freely. Even Congress candidate from Jalandhar, Rajinder Beri was questioned by the media after a sting operation revealed the investigating journalist, posing as a voter, was given a piece of paper with a signature on it, when he asked for some incentive. All he had to do is show the slip in the nearby liquor shop to avail 6 bottles of liquor. Cash and Liquor are the incentives given to vote in favour of respective political parties since long but its time the voters realize their moral responsibilities. Blaming the parties is easier but is it not a fact that if the crowd denies such unwanted incentives, this would cease to work for people who buy India’s future so cheaply. We all want an honest government but when it comes to us, we become dishonest to ourselves. Its time we realize, Anna lies inside all of us and before supporting the Lokpal Bill we should support the Honest Human inside us which knows the difference between wrong and right clearly but ends up giving up infront of dishonesty. Effect Of Excessive Consumption Of Alcohol. Excessive drinking kills your Conscious Mind, first. Liver comes second ! Minimize Effects If Not Alcohol. Not that we are of the opinion to support drinking as a habit or even a past time but keeping in pace with current life style standards, consumption of alcohol has increased not only in western countries but in India as well. May be, alcoholic beverages if consumed in small quantities and in long intervals does not affect in the long run but one can fall prey to its short-term effects, readily. With today’s trends, alcohol consumption has gained popularity from teenagers in high school, in India and world over and that is not the worst news, the problem is that these young people who indulge in such activities do not know how to drink responsibly or even healthily. How many teenagers have you heard in recent past slamming their cars or two-wheelers at excessive speeds, under influence of the hypnotic sedative alcohol? Guardians and family members try to bring to the notice of their young siblings the long-term effects of alcohol like diseases effecting the liver, kidney, or heart in the long run, but some people do not even survive even to get to that pitiful stage as negligence and irresponsibility cause accidental deaths to not only themselves but others as well. One may not restrict himself, in situations like corporate parties etc. where alcohol is limitless and people drink like there is no tomorrow.However, it is important for friends and guardians to inform people about the short-term effects of alcohol and the precautions they should take to minimize its effects. The amount and the circumstances of consumption of alcohol affect to a large extent the state of intoxication. 1) Alcohol is not a support system for emotional distress and is advisable to avoid consumption under such situations and even if consumed should be with responsible company and within permissible limit. 2) Never drink empty stomach; always have a good meal at least half hour before consumption of alcohol and may be some cheese some 15 to 20 minutes before its actual consumption as this would slow down the absorption of alcohol in the blood stream and will not be too intoxicating unless consumed in large quantities. 3) Consumption of a lot of water or fluids except aerated water during and after consumption of alcoholic beverages not only helps reduce hangovers, but also dilutes ones drink and fills up the stomach to an extent that one does not want to consume more. 4) Stop consumption of alcohol at least 2 hours before you sleep so that your sleep is not disrupted and continue to drink water till at least 1 hour before you sleep. 5) Avoid Smoking while you consume alcohol, as this doubles chances of intoxication. 6) Healthy snacking is very important…. put an end to deep-fried veg or non-veg food, wafers, peanuts etc as they not only increase the risk of heart diseases later but also increases chances of acidity which in turn may result in nausea and giddiness. 7) Snacks like boiled vegetables/ or meat, char gilled items, various veg and non-veg salads, should be preferred over fried food. 8) Try not to eat too heavy after drinking, and at least have a gap of 15 to 20 mins. before heading to eat after drinks. Definitely avoid rich and fatty food as that may lead to indigestion and cause nausea.